This study evaluates the impact of a College to University Pathway Program in the Faculty of Social Science and Humanities at The University of Ontario Institute of Technology. The findings support the assertion that Pathway students perform as well as or better than students who enter university directly from secondary school. This finding is encouraging for universities and colleges as they work toward developing additional Pathway Programs and improving the Pathway Programs they may already offer. Ontario community college students are enrolling in university degree programs in increasing numbers, requiring efficient pathways that facilitate student transfers (Centre for Spatial Economics, 2010). The processes for transferring from Ontario’s community colleges to its universities have historically been a patchwork system. In other provinces coordinated college-to-university transfer systems reflect the fact that their colleges were established to provide pathways to university; Ontario’s colleges were not designed with this intent. They were designed and funded to operate as stand-alone institutions serving the need for practical pre-job training. As a result, the various transfer, or pathway programs, that emerged within Ontario were typically institution- or program-specific and often without the guidance of provincially mandated guidelines. Nevertheless, this patchwork system did have some success. From 2000-2001 to 2006-2007 the proportion of students entering community colleges with the intent of eventually going on to University increased from 16% to 21% (ACAATO, 2005; Colleges Ontario, 2008). It had become clear that students were seeking to “develop their academic skills and knowledge to better prepare them for University” (Centre for Spatial Economics, 2010, p. 7). Within this context, in April 2004, The University of Ontario Institute of Technology (UOIT) created its first Pathway Program, facilitating the transfer of college students into its degree programs. This Pathway Program allowed Ontario community college graduates to enter UOIT in the third year of a four-year degree program in Criminology and Justice. In this case, there were two prerequisites: successful completion of a community college diploma program in either Police Foundations or Law and Security Administration and successful completion of a four-course UOIT “Bridge Program” with a “B” average. The “Bridge Program,” or simply “the bridge,” consisted of a set of specific UOIT courses that college transfers would have to complete to qualify for admission into their chosen degree programs. Subsequent to the creation the pathway program from Durham College (DC) to the Criminology and Justice program UOIT and DC created other Pathway Programs. UOIT and DC have instituted multiple college-to-university and university-to-college Pathway Programs to facilitate completion of degrees, diplomas, and certificates. All of these programs include prerequisites and may or may not include completion of a bridge. These additional pathway programs are not examined in this study. They are to be reported in a separate paper. to assess student performance in post-bridge degree program courses. Course-specific letter grades for Pathway students and Traditional students in each of the C&J and LS courses included in the respective bridges. The courses selected for analysis were chosen to yield representative samples of students enrolled in the bridge courses: students who had completed the bridge but who had not yet graduated, and a sample of Traditional students in the same courses. Cumulative GPA scores and individual course letter grades were used to compare the grades of Pathway students with those of their traditional counterparts. The quantitative data were analyzed using Minitab® statistical software. Pathway students in the two FSSH programs achieved considerably different GPA scores in their respective programs. A visual inspection of the data shown in Figure 1 tends to indicate that, in general, Traditional students outperformed Pathway students in the four mandatory C&J bridge courses. Specifically, Traditional students seem more likely to earn grades of B+ or higher and less likely to achieve grades of C+ or lower in the four C&J bridge courses. Additionally, more Pathway students earned failing grades in the four bridge courses than did their Traditional counterparts. Figure 1. Comparing Pathway and Traditional student performance in the Criminology and Justice Pathway Program. Figure 2. Comparing Pathway and Traditional student performance in the Legal Studies Pathway Program. By way of contrast, performance of Pathway students in the four mandatory LS bridge courses appears to be slightly better than their Traditional C&J counterparts. 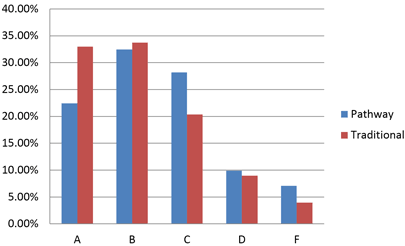 Specifically, as illustrated in Figure 2, LS Pathway students were more likely to earn grades of B+ or higher and less likely to earn grades of B- or lower in the four LS bridge courses. However, it should also be noted that more Pathway students earned failing grades in the four bridge courses than did their Traditional counterparts. Consequently, although the data suggest that LS Pathway students attain higher grades than Traditional students while completing their Pathway Program, it would be unwise to offer a generalized judgment based on a visual impression of aggregate data. While the cumulative GPA results described above are tentative in nature, more certain results were obtained when comparing Pathway and Traditional student academic achievement between specific bridge courses. For example, in the C&J Abnormal Psychology (Figure 3) and Sociological Theories of Crime (Figure 4) bridge courses, the difference between the performance of the two groups is statistically significant. Specifically, Traditional students outperformed Pathway students in both bridge courses, with grade distribution shifted slightly higher for Traditional students. For both courses, the P-value for the shift is equal to 0.000 by both the Chi-squared test and an alternative “goodness of fit” test employed in this study, hereafter referred to as the “alternate test” (see Goodman, 2012). However, the visual impression in Figure 3 is somewhat ambiguous. More specifically, although Pathway students have proportionally fewer “A”s and more “F”s than the Traditional students; they also have more “B”s. As such, the underlying distributions may be relatively close. Future research is required to better understand if it is the nature of the course that accounts for this difference in performance distribution, or if it is an artifact of course design, or if it is attributable to another factor within the program which was not examined in this study. Figure 3. 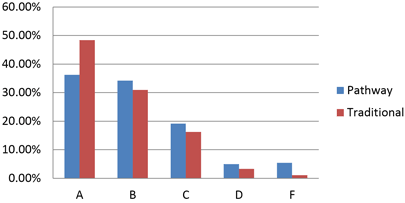 Distributions by grade for the Abnormal Psychology course. Figure 4. Distributions by grade for the Sociological Theories of Crime course. Although the quantitative data indicate that Traditional students outperformed Pathways students in C&J bridge courses, related qualitative data reveal an interesting contrast. Specifically, two of the four C&J Pathways students interviewed for the larger study indicated that the Abnormal Psychology bridge course was unnecessary as they had completed a similar course in their college programs. For example, one student asserted, “Everything that I learned in the university class I already knew. It was just like a refresher class for me.” Similarly, another student indicated, “I had already taken Abnormal Psych 1 and 2 in college … so I was just re-learning it [at UOIT]. … There was nothing new for me.” This raises an interesting question: If the Abnormal Psychology bridge course contains redundant content, why are the Pathway students not outperforming the Traditional students in these courses? Other findings in the full study also indicated that Pathway students should achieve higher grades than their Traditional counterparts in courses with content similar to that in their community college courses. However, even when we exclude this expectation, the data seem to indicate that the overall performance of the Pathway students is not significantly different from that of Traditional students completing the same courses. As such, further research is required to more closely examine factors that may influence the success or failure of Pathway students in bridging courses with content similar to that of courses completed in their college programs. While Pathway students in the C&J Pathway Program may be said to fare less well, academically, than their Traditional counterparts in the bridge courses, they outperformed their Traditional counterparts in degree program courses beyond the bridge (Years 3-5 courses) (Table 1). With the exception of Year 5, the GPA scores for C&J Pathway students is higher than their Traditional counterparts. As can be seen in Table 1, a clear trend in the cumulative GPA score data for Pathway students in the LS program has yet to emerge as this Pathway Program entering its 5th Year at the time of writing. As it stands, while the cumulative GPA score for the LS Pathway students drops below the Traditional student score in Year 3, it rebounds and surpasses the Traditional student score by the end of Year 4. Overall, Pathway students from both programs who successfully matriculated into the B.A. Program performed better, on average, than their Traditional four-year program peers. The qualitative data obtained from Pathway students and Pathway Program Academic Advisors interviewed for the broader study provide insight and potential explanations for the academic success of Pathway students. * The analysis has been extended to Year 5 to include students who require more than the traditional 4 years to complete a degree. ** There is no data for PATHWAY PROGRAM students in legal studies in year 5 because the program has not been operating long enough to have students in the 5th year. *** This data includes the GPS for all students taking courses from Year 1 to Year 5. Academically, I would say, students who make it through the bridge … [are generally] stronger students, ultimately. … They’re really motivated to work … They are just much more engaged and I think that’s … [because they’re] coming out of the college system. They’re in a great program at the college that they were already engaged with and I think that they carry that [engagement to the university]. They’ve really made a conscious decision to me here. They’re passionate about what they do. I prefer [university] because in college, we would have an essay and it would be a research paper … as opposed to university where it’s: “Do the research, but I want to hear your opinion on it. Why do you agree with this person?” So, it’s more engaging, as opposed to college where everybody says it’s more hands on. But then at the end of the day, university is a lot more engaging, when you really think about it. So I definitely prefer it. Pathway Programs serve a useful purpose, providing opportunities for students to achieve their educational goals and prepare for their desired careers. This paper summarizes the results of one component of a broader study which details the experiences of students enrolled in various Pathway Programs offered at UOIT. The findings presented in this paper support the assertion that when community college programs are effectively connected to university Pathway Programs, students are sufficiently prepared to meet with success at university. Moreover, in addition to successfully completing any bridge courses they may have to take, Pathway students may outperform Traditional students in post-bridge courses they need to complete for their degrees. Collectively, the findings in this study seem to indicate that these community college diploma programs enhance Pathway Program performance. This finding is encouraging, for not only Pathway students, but for universities and colleges in general, as they work toward developing additional Pathway Programs and improving the Pathway Programs they may already offer. We conclude this paper with personal reflections from a SSH Pathway student addressing college – university Pathway Programs. There are, of course, some limitations to this study. A more detailed investigation into why Pathway student academic and overall performance varies in the manner highlighted in this paper is warranted. Some questions worthy of further study include: Why do Pathway students appear to perform less well than Traditional students in bridge courses, yet outperform them in later years? Is this trend apparent in other Pathway Programs? If so, what are the mediating factors that influence this trend / relationship? Goodman, W.M. (2012). Measuring Changes in the Distribution of Incident-Outcome Severities: A Tool for Safety Management. Case Studies in Business, Industry and Government Statistics (CSBIGS), 5(1), 32-43. This study was made possible by the generous support of Durham College and the University of Ontario Institute of Technology (UOIT). We would like to thank Darryl Hand and Marc Hall, our dedicated research assistants, for their assistance in completing this project. Ann LeSage is an Associate Profession in the Faculty of Education at UOIT. John Samis is an Assistant Professor in the Faculty of Health Sciences at UOIT. Ron Hinch, is a Professor in the Faculty of Social Science and Humanities at UOIT. Fabiola Longo is a Nursing Professor at Durham College teaching in the collaborative (DC/UOIT) BScN program and year one coordinator. Maurice DiGiuseppe is an Assistant Professor in the Faculty of Education at UOIT. William (Bill) Goodman is a Professor in the Faculty of Business and Information Technology at UOIT. Jennifer Percival is an Associate Professor in the Faculty of Business and Information Technology UOIT. Arlene De La Rocha a Professor in the Durham College-UOIT collaborative Bachelor of Science in Nursing program. Anna Augusto Rodrigues is a Professor in the School of Media, Art & Design at Durham College. Phil Raby is a Professor in the School of Media, Art and Design at Durham College. Otto Sanchez is a professor in the Faculty of Health Science at UOIT.